Rotterdam is expanding in the sea. A new offshore port is accessible for the largest ships in the world. Ships that measure up to 400 meters and ships that can lift a drilling platform out of the sea. This new port is called “Maasvlakte 2”. Rotterdam harbour is the heart of the Dutch economy. And it is quite something. We drove the 50 kilometers from the east off Rotterdam to the beach (!) at the port mouth. Not a typical scenic tourist trail. I only saw factory terrains. Huge Chemical and Petrochemical plants. Shipping companies and Coal Terminals. It went on and on. If you like industrial landscapes put this on your bucketlist. If you only want to see the new port in the sea and avoid the industrial zone we tell you to make a boat trip from the center of Rotterdam. Or, even better, rent a bike at the railway station of “Hoek van Holland” take a Fast Ferry and cycle around the harbour. I did not say take your pedalo. Futureland is the starting point for boat- and bus tour through the harbor. It is the best and only place in the seaport for traditional Dutch soup (Today they serve: “Snert”) or hot chocolate and apple pie. And we do need a hot cup of soup desperately because our vsit is on a clammy foggy wintersday. At the Information Center we visit the permanent exhibition showing e.g. acheological finds from the bottom of the North Sea and a detailed history of the creation of the “Maasvlakte”. In Futureland you will be encouraged to operate computer simulations and you will learn about techniques used to gain land from the sea. You will get an insight the combinations of modern and old techniques being used to build a lasting port for the 22nd century. You might get obsessed by a computerized system for offloading a container vessel. Moreover you can get insight in the future of this environmentally friendly evolution of a port. 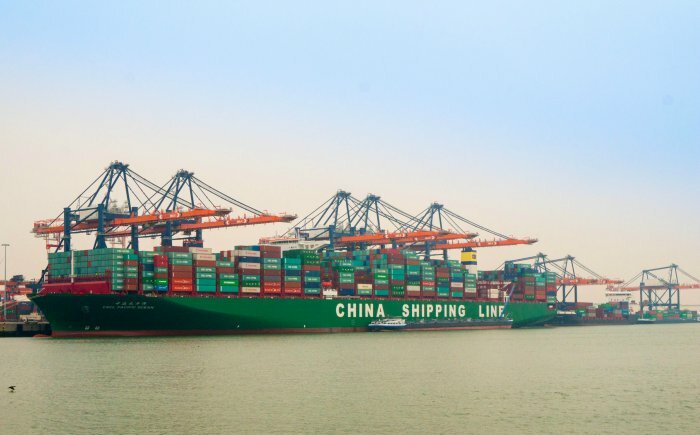 Maasvlakte Rotterdam welcomes worlds largest containership. The Maasvlakte was constructed by two of the world largest (Dutch) dredging companies: Boskalis en Van Oord in a partnership called PUMA. Rotterdam is the largest harbor of Europe. The gateway to the EU. The harbor’s central canal is 600 meters wide and 20 meters deep. This port offers acces to the worlds largest existing container ships. Vessels carrying up to 19 244 containers are processed fully automated. Computer controlled stacking cranes and automated guided vehicles transport the containers to a storage place; overload containers to smaller ships and arrange the start of inland transport by train and lorry. On the quay there are no people. The hybrid automated vehicles find their way to the docking station on their own when batteries are low. I only saw a few surveillance cars driving around. Beside that there was no sign of human activity. The 2nd of March 2015 the largest container ship in the world – MSC Oscar – arrives in Rotterdam. The vessel is 396 meters long and 59 meters broad. Lately the size of containers ships increases permanently. The port of Rotterdam is prepared for their arrival. Public transport: If you want to go straight form Rotterdam Airport to Maasvlakte 1 we advise you to take bus 33 to “Berghaven Hoek van Holland” where you catch the Fast Ferry to Maasvlakte 1. Put this tour on your bucketlist. The ferry takes you through the port mouth of Rotterdam with its intensive shipping traffic. It is awesome. To travel by bus or train in Holland in general we advise to buy an “OV-Chipcard”. This card is available in the Arrival Hall of the airport. By car or bicycle: navigate to “Berghaven Hoek van Holland”. From the center of town: In July and August you can make a daytrip by boat to the Maasvlakte. The boats sail every day. The rest of the year the boats sail at random. If you want more informatian call the Company Spido: 010 – 275 99 88. From Hoek van Holland: Take a train from where ever you are in Holland to “Berghaven Hoek van Holland”. Rent a bycycle at the railwaystation in Hoek van Holland. Then take the Fast Ferry – with your bike – to Antarticaweg on the Maasvlakte. From there it is a 5 km ride to the visitor center Futureland. World Harbour Days Rotterdam: 4, 5, and 6 September 2015. Shooting club: The shooting club offers different arrangements for improving your shoouting skils. You do not have to bring your own bullets. Everything is there. There are professional instructors and shooting ranges. Moreover you can shoot clay pigeons. For more information and you reservation call: 0181 263 939 or 06-53125343. Where to eat: The one and only restaurant on Maasvlakte is at the Shooting club. Navigate to: Krabbeweg 125, 3199 LE Maasvlakte Rotterdam. We advise to make a reservation: 0181 263 939 or 06-53125343. From April to October the place is open on Wednesday, Saturday and Sunday from 13.00 hours. Cheap Hotels: Google to “Stay Oke Rotterdam” and “Stay Oke in The Hague”.